Typical asphalt shingle roofs are really common down here in Texas (as in most places), but they aren't ideal due to our summer temperatures that can stay in the 100s (or at least the 90s) for weeks on end. (It's only May, and we're already there.) The sun and heat break down the shingles much faster than usual -- a "30-year" shingle might only last ten or fifteen years before the time comes to replace it. That's one of many reasons we chose a metal roof, which cost two or three times as much as an asphalt roof but shouldn't need to be replaced, like, ever (at least while we own the house, which we hope will be decades). 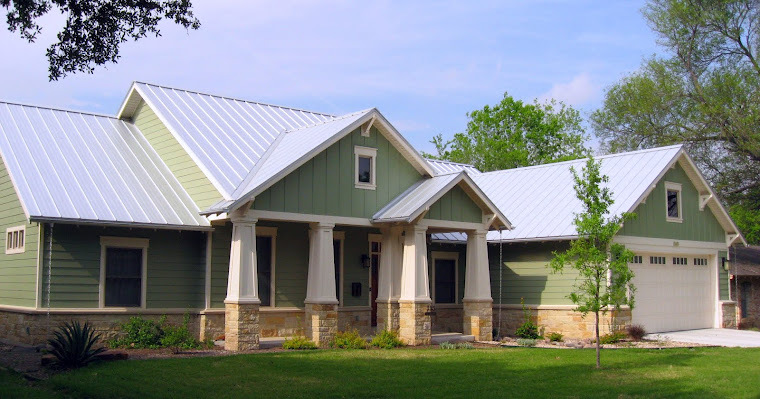 Not only is a metal roof not affected by sun and heat like asphalt shingles are, but it even reflects much of the light that hits it, keeping it (and the sheathing beneath it) cooler. 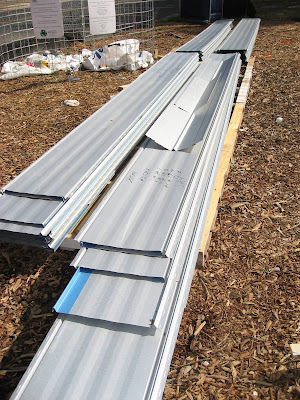 I think Austin's current building code requires a radiant barrier under every new or replaced roof, which is usually achieved either through a special silvery spray paint applied to the underside of the sheathing (in the attic space) or by metallic sheets attached to the underside of the roof. How the application of a thin silvery surface in a dark attic makes any difference to the temperature mystifies me, but people smarter than I have figured out that it does. Anyway, a metal roof acts as its own radiant barrier, further keeping the heat out. Taking things to another level, metal roofs are perfect for sealed attics. A traditional attic needs to be vented (usually at the soffit -- the underside of the overhang -- and the ridge or somewhere neat the top) so the heat that builds up has a way to escape. But even with proper venting, attics down here can easily reach 120 degrees during the summer. With a sealed attic, the insulation (usually spray foam) is placed against the top of the attic space instead of along the ceiling of the floor below, keeping the attic within the "thermal envelope" of the house (the space that is heated/cooled). As a result, our attic stays within about five degrees of the temperature of the main level, so it's never too hot (or cold) to comfortably go up there. More importantly, though, it means that our air conditioning equipment doesn't have to work extra-hard to force cooled air through ducts run inside an oven (or, in the winter, warm air through a meat locker). In additional looking super-cool, they keep the hot metal up off the underlayment and sheathing layers and also provide a channel where heat that manages to find its way under the metal can still escape (kind of like the vents in a traditional attic, but a few layers farther toward the outside). Bottom line: our roof system is a huge part of keeping heat out of the house, which (along with blown-in cellulose insulation in the walls and high-quality windows) is a huge part of minimizing our energy use and keeping our utility bills about the same as they were in our condo, which was half the size of the house. 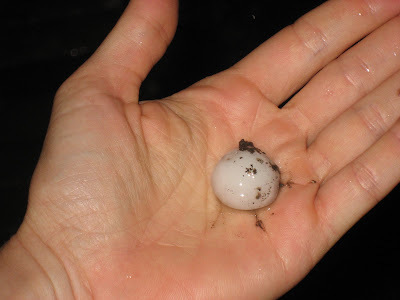 So, with sun and heat pretty much crossed off the list of potential threats to our roof, hail moves up in importance. And the other night our metal roof had its first real run-in with hail. We even get a discount on our homeowners' insurance because metal roofs are proven to protect against hail damage. A question we are frequently asked is whether the metal roof is loud in the rain. Early on, we raised that issue and were told that it's not. Which is sort of true and sort of a total lie. With spray foam insulation under the roof, it's true that noise is well baffled. But that doesn't help with the overhangs, where the rain hits the completely uninsulated eaves. And we totally hear that through the windows. Times a hundred when it's hail, we just learned. It sounded like thousands of marbles being thrown, repeatedly, at the roof. In bed at four-something a.m., the sound was unmistakable. Although it could have been mistaken for gunfire. Or fireworks.